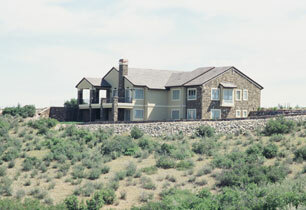 This home in Roxborough Park, southwest of Denver, is set into a steep site. 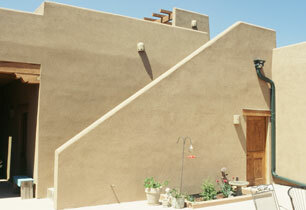 A four car garage made of reinforced concrete has a courtyard/patio and a family room above it. 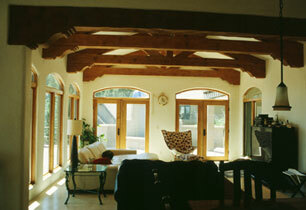 the home is designed in what some call California southwest ar Santa Barbara style. 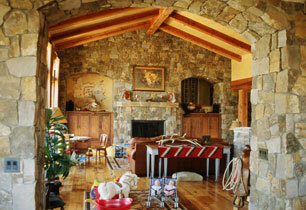 The home was actually built by owner. 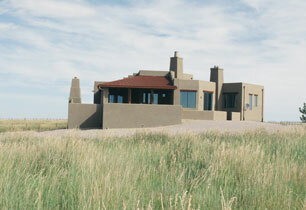 This home is set on a hill with a dramatic natural landscape, west of Denver. 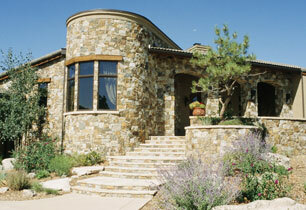 This rustic home uses thin, real stone, Telluride Stone, both inside and out. 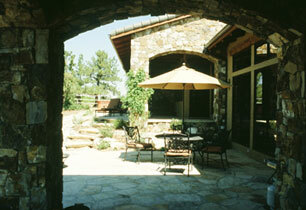 Outdoor spaces, shaded and sunny, allow outdoor living while taking advantage of views. Bill Vickroy was the contractor. 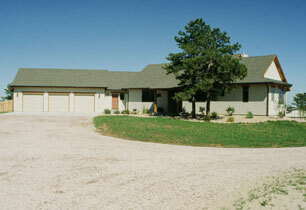 The Goodrich home was built by the owner using an ICF (insulated concrete form) system. 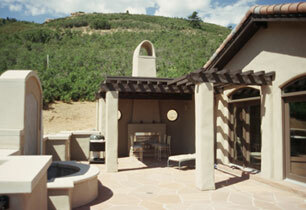 This concrete and Styrofoam wall system provides a very well insulated, airtight and strong. 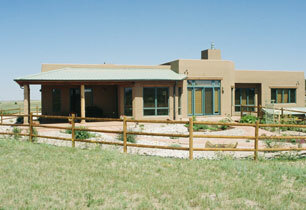 Passive solar features and a geothermal heat pump help reduce energy costs to a minimum. 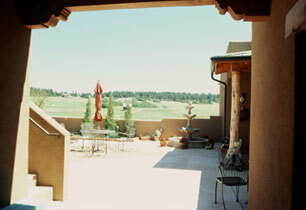 It is designed in a southwestern style around a central courtyard to shelter the owners from the prairie wind near Franktown, Colorado. 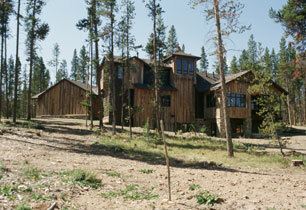 The Schurr residence is near the Winter Park ski area in the Colorado mountains. 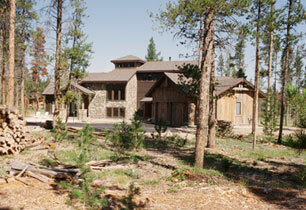 It uses recycled wood as siding material in a design that is both rustic and mine shaft. 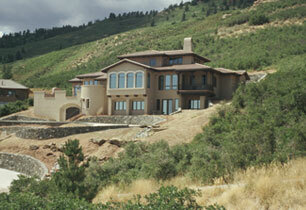 At 8500 feet in elevation, the home uses special sprayed on insulation to protect against the cold and the snow. 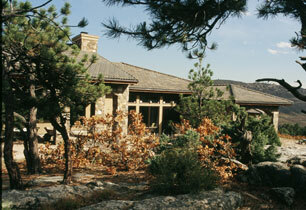 It was built by Terra-firma Custom Homes. 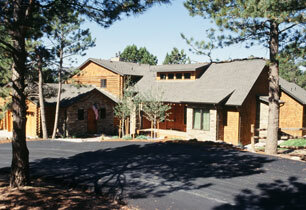 This small home was built for sale in Fox Acres Country Club, near Red Feather Lakes, Colorado by Larry Lyon. 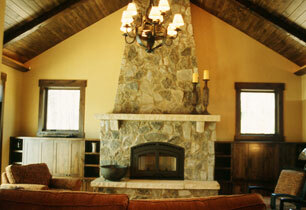 It uses a rusted steel roof, log veneer siding, Kermits Logworks and rough wood timbers for a cabin look. 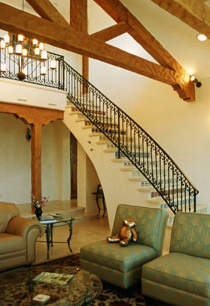 A gourmet kitchen, outdoor patio with grill and fire pits, dramatic fireplace and luxury master bath make it an ideal second home, set on a challenging golf course. Near Castle Rock, Colorado. Built by owner. 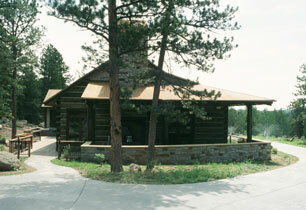 Near Kiowa, Colorado. 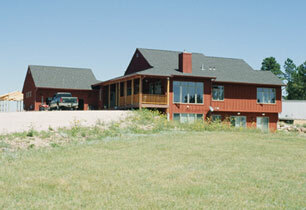 Built by Polo Homes Ltd.
Near Franktown, Colorado. 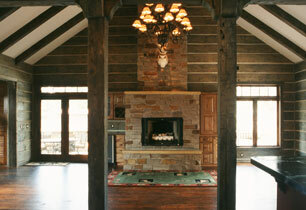 Built by Jim Weatherly. Near Franktown, Colorado. 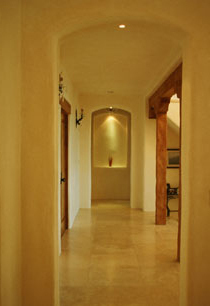 Built by Polo Homes Ltd.